Lower the day-to-day stress of the workplace and reap the rewards. Stress-related employee turnover, absenteeism and waning morale all affect the bottom line. Job stress and related problems cost Australian companies millions of dollars per year. After our visits you will notice the morale lift in the office. Relaxed workers are more likely to co-operate better with each other, lowering stress and improving the work environment for everyone. 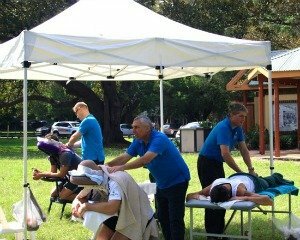 Massage can be used to help your team through a demanding time, or reward them for their extra effort. Combat the stress of restructuring, intensive projects, and other hectic times of the year. Also perfect for de-stressing and helping everyone work more effectively towards a deadline or during product launches. Medical research*, indicates that a basic 15 minute chair massage, provided twice weekly, not only decreased job stress but significantly increased the amount of work productivity.